The beginnings of Five Wounds can be traced back to one man, Monsignor Henrique Augusto Ribeiro, who through sheer vision and independent will brought a dream to fruition. 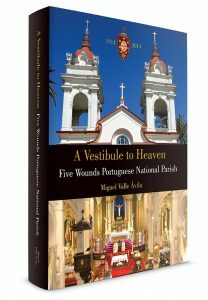 This special limited edition publication commemorates the centennial of the Five Wounds Portuguese National Parish in San José, California. Throughout the book, you will experience Msgr. Ribeiro’s vision, hardship and the realization of a dream to build a national parish in San José, from the early 1900s to the present day. History comes to life with full color photographs and illustrations, many never before published, and accounts of all the pastors and administrators of Five Wounds Parish. This excellent book is dedicated to the celebration of the parish centennial—learning from the past, growing in the present, and creating a foundation for the future.